In order to counter de-legitimization we must first define the term as clearly as possible. This is a basic tool necessary to assist those working on the issue to separate the wheat from the chafe, i.e. 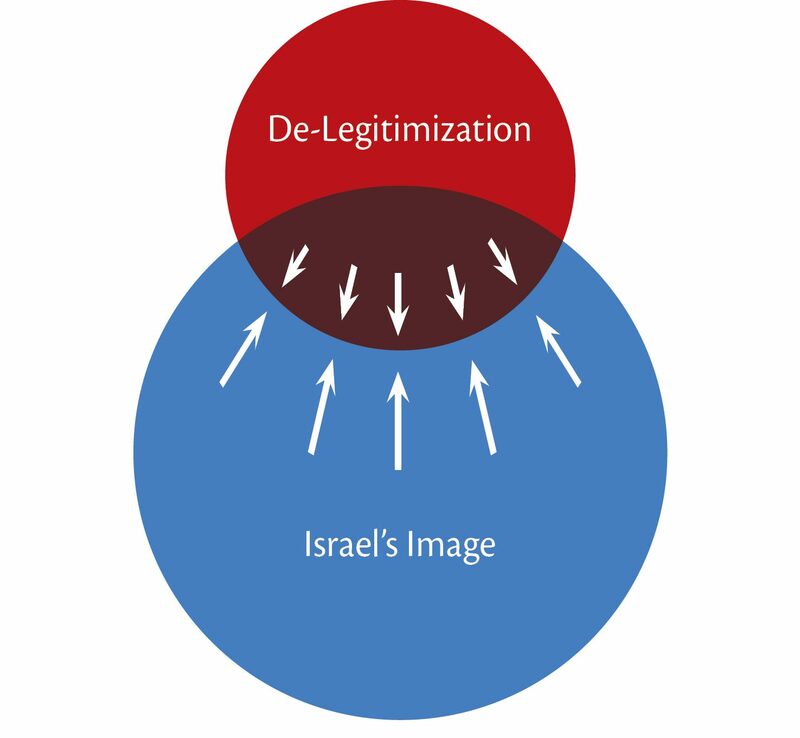 to differentiate between de-legitimization and legitimate criticism of Israel, to focus on the heart of the phenomenon, and to craft a clear and effective strategy. There is a considerable public discourse on this topic, especially but not only in Israel, and numerous research organizations have dealt with it in recent years. However, hardly any of them has adequately defined de-legitimization and thoroughly distinguished and delimited between this phenomenon and legitimate criticism. Different people and groups addressing de-legitimization, including within the Israeli government, operate according to disparate implicit meanings collected under the same heading. Zionism is based on several core assumptions: that Judaism is not only a religion but also a nationality; that it is just and appropriate that the Jewish people have the right to self-determination and to exercise it in its own sovereign political entity; and that Jewish self-determination is inherently attached to a specific geographical location (notwithstanding the political debate over the future of Judea and Samaria). Therefore, denying any of these presuppositions is essentially the negation of the Zionist idea, that the State of Israel is the nation-state of the Jewish people. The above definition, ostensibly clear and almost self-explanatory, has raised quite a few questions and has proved insufficient to determine the exact space it covers and to distinguish between de-legitimization and legitimate criticism, even when severe. Some argue that the very use of the term grants a kind of implied legitimacy to an illegitimate phenomenon and to the discourse it creates. Some Israeli governmental bodies have, therefore, offered alternative language to characterize the phenomenon, such as “the assault on Israel’s legitimacy” or “the attempt to undermine Israel’s legitimacy.” These, however, have not caught on. The basic definition of de-legitimization raises a thorny question: Is it right to lump together under the same heading Jews and Israelis who reject, for authentic ideological or religious reasons, the idea of ​​Jewish self-determination in a nation-state with extremist Islamic elements or anti-Semitism characterized by their hatred of Jews and Israel? Throughout the generations, there have always been religious, spiritual and intellectual streams within the Jewish people that rejected the expression of ​​Jewish self-determination in the form of a state, whether they were Haredim who rejected any national-secular definition, leftists advocating a bi-national state, or thinkers like Ahad Ha-Am who espoused that Jewish collective identity should be expressed in a spiritual rather than political way. Our conclusion is that, by definition, both types are de-legitimizers, yet the way each should be regarded and confronted requires different approaches in most cases, mainly because of differing points of departure and intention. It would be wrong to relate to those who wish the Jewish people harm in the same manner as those who wish it well but believe that its well-being should not be realized through a nation-state, however misguided in our opinion that may be. In this context, one must also be sensitive to preserving Israel’s democratic fabric, as long as the foundations of the state are not undermined. Another question begging an answer is whether denying the Jewish people a distinct nation-state while calling for a bi-national or multi-national state in the historical Land of Israel should be considered a form of de-legitimization. Ostensibly, the answer straddles a theoretical borderline, since those holding these positions (in contrast to those who call for a state for all its citizens) may accept the Jewish people’s right to self-determination within the framework of a sovereign political structure in the Land of Israel, just not in an autonomous, separate entity. At the same time, a deeper look reveals that most of those who hold such a position essentially aim to de-legitimize Israel, according to our definition. Moreover, this kind of argument may be an important indicator of de-legitimization. Therefore, to make an accurate determination, it is essential to assess to the extent possible, the point of departure, intention, and goal of these actors. More importantly, the above-mentioned core definition is insufficient when dealing with implicit or disguised de-legitimization that falls into a gray area. As former British Prime Minister Tony Blair correctly noted, most of Israel’s detractors deny that they are denying its very legitimacy. Only a minority of de-legitimizers explicitly negate Israel’s right to exist as the nation-state of the Jewish people. Most of the attacks on Israel’s legitimacy are carried out from a legitimate or ostensibly legitimate space in the context of the ongoing conflict with the Palestinians, but in a manner that crosses an abstruse line into de-legitimization, as defined by us, with an emphasis on the demonization of Israel. The rationale for masking de-legitimization in this way appears to be that explicit de-legitimization of Israel is not yet politically correct in the West, but this does not mitigate the severity of the phenomenon or its potential dangers. The harsh, continuous and repetitive anti-Israel criticism of this type, most of it in the Palestinian context, reverberates and has the cumulative effect of placing a question mark over Israel’s legitimacy, even if implicitly. Indeed, in the same “gray area” between criticism and de-legitimization, we find a hidden drift dynamic from criticism to de-legitimization, which often escapes the critic’s awareness, and we are not just referring to the radical fringes. (blue circle). These actions in concert will inhibit drifting overlap and exert a separating force between the two circles. 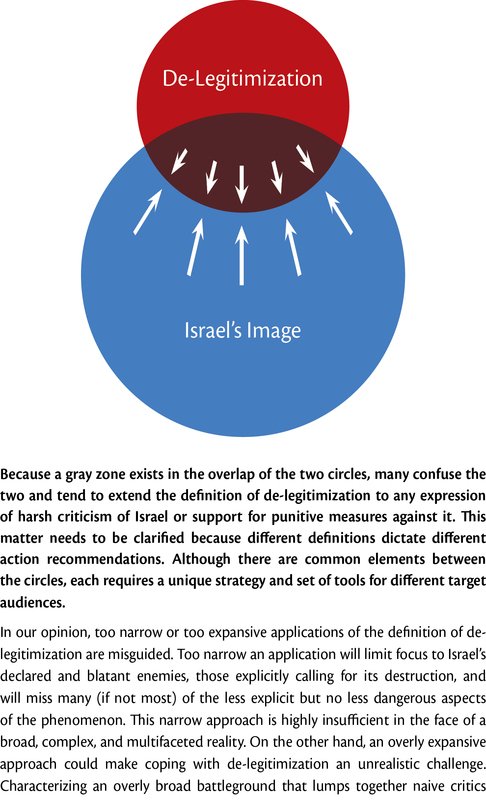 Because a gray zone exists in the overlap of the two circles, many confuse the two and tend to extend the definition of de-legitimization to any expression of harsh criticism of Israel or support for punitive measures against it. This matter needs to be clarified because different definitions dictate different action recommendations. Although there are common elements between the circles, each requires a unique strategy and set of tools for different target audiences. In our opinion, too narrow or too expansive applications of the definition of de-legitimization are misguided. Too narrow an application will limit focus to Israel’s declared and blatant enemies, those explicitly calling for its destruction, and will miss many (if not most) of the less explicit but no less dangerous aspects of the phenomenon. This narrow approach is highly insufficient in the face of a broad, complex, and multifaceted reality. On the other hand, an overly expansive approach could make coping with de-legitimization an unrealistic challenge. Characterizing an overly broad battleground that lumps together naive critics with malicious deniers of Israel’s right to exist, impedes the focus and attention required for adopting or adjusting policies. It drags the issue, and the tools to confront it, into a sensitive and controversial political space, first and foremost within Israel itself, and undermines the likelihood of successful outcomes vis-à-vis important target groups and actors. Proper distinction between Israel’s critics and its de-legitimizers is essential in order to effectively deal with the phenomenon. Each category requires its own response, and conflating them could undermine effective messaging within the larger group that does not contest Israel’s right to exist. Israel must also be careful not to appear dismissive of criticism or seeking to silence those voicing it. Clearly, it is imperative to develop a set of indicators for identifying potential de-legitimization and the tools and tests for discerning between genuine de-legitimizers and those expressing legitimate and pointed criticism, difficult and unpleasant as it may be. In principle, this could apply even to cases of those who espouse boycotts and sanctions, as long as they do so out of a genuine belief that they are legitimate levers of influence on Israeli polices without seeking the annihilation of the state. This is a profound challenge because the “gray zone” is, by definition, broad, amorphously bounded terrain, and because examining and interpreting intent is inherently problematic. In some situations, reality provides an inexact answer. In some cases, de-legitimization is self-evident. In other cases, an answer exists out there but it is not explicit and requires searching, uncovering, and exposing it in a way that minimizes any doubt regarding the intention behind it. Finally, there are cases, when we will be left with unresolved uncertainty and ambiguity. In light of this, it is important to develop our own indicators and demarcation lines that can assist us in our assessment and analysis of the reality out there.